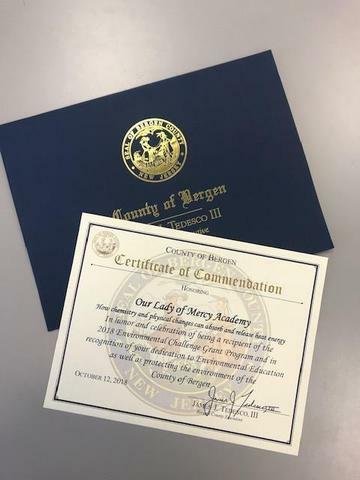 Our Lady of Mercy Academy received the 2018 Environmental Challenge Grant in recognition of our dedication to Environmental Education as well as protecting the environment of the County of Bergen. We are pleased to share that Our Lady of Mercy Academy has received the 2018 ENVIRONMENTAL CHALLENGE GRANT PROGRAM!! Miss Laura Butterworth will use this grant with her students to study how chemistry and physical changes can absorb and release heat energy. Thank you to Bergen County Executive, Mr. James Tedesco, III and the County of Bergen for this honor.